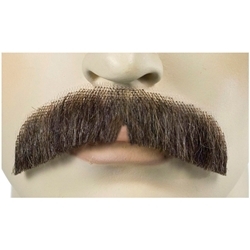 The human hair downturn mustache is a classic style that can be used for almost any time period. It is a simple look that has a full mustache across the upper lip that curls down just a little at the ends. Please note that this item requires spirit gum to apply.